Have you ever wondered why companies store just about everything else apart from electricity? Due to periodic supply and demand imbalances, they store foodstuffs, water, fuel and so on. For electricity, many companies opt to oversize the infrastructure. Is this really the right choice? Nowadays, plenty of engineered solutions can be applied to energy storage demands. A company’s choice will depend on their necessities and the nature of their infrastructure. One of these solutions, maybe the one you are looking for, are Ice Storage Tanks. This solution not only helps companies to make the most of the energy produced, something that can also be achieved with Stratified Thermal Energy Storage Tanks. Ice Storage Tanks contribute in reducing your plants footprint more than Water Storage Tanks. 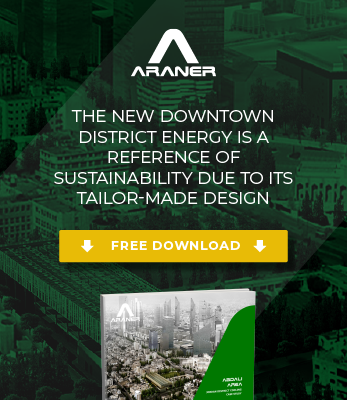 A custom-built design of the tank is crucial to achieve this, which is why ARANER implements individual solutions for each client. Thermal Ice Storage was a popular practice back in the 1930s. Dairy farmers used it to cool their milk because of its affordability and reliability. The technology has also been used for comfort, specifically in air conditioning. For your information, the derivation of the term “ton of air conditioning” is based on the amount of ice used. Today, you can find Thermal Ice Storage Tanks in various industries, including supermarkets, district cooling, meat processing, air conditioning and emergency cooling. With tanks using harvesting technology, the recirculation pump will send water to the cooling coils of the ice generator during the charging period. Water will freeze and some of it will drop into the tank still in liquid phase. During the discharging period, the chilled water pump starts to work, pumping the cold water from the bottom of the tank and making it circulate through the cooling coils of the load, where it is heated. It will then pass through the ice generator again. Ice Storage Tanks can also use, among others, external or internal melt ice-on-coil storage technology. External melt ice-on-coil storage systems, sometimes referred to as an ice builder, build and store ice on the exterior surfaces of a heat exchange coil submerged in a non-pressurized water tank. To charge the storage system, liquid refrigerant or a secondary coolant such as glycol solution, is circulated inside the heat exchanger tubes, causing ice to form on the outside of the tubes. To discharge stored cooling, the ice on the tubes is melted by warm return water which circulates through the tank. The resulting chilled water is used to meet the cooling demand. Internal melt ice-on-coil storage systems use a secondary coolant as the charging and discharging heat transfer fluid, circulating it through tubes or coils submerged in water-filled tanks. To build ice, a chiller cools the coolant and ice forms on the outside of the tubes. To discharge storage, warm coolant flows through the tubes, melting the ice from the inside out and reducing the coolant temperature for use in meeting the cooling demand. Tanks can be located above ground, partially in the ground or underground, which is a great boost for flexibility requirement. The only thing you need to ensure is that the ground is firm enough to support the massive weight. At first sight, many people would think that the tank is simply a huge liquid reservoir. On the contrary, energy storage solutions such as Stratified Thermal Energy Storage Tanks or Ice Storage Tanks have a more far-reaching role. They are about dealing with the cooling load that has prompted us to oversize our structures for many years. ARANER’s Ice Storage Tanks are about balancing the energy demand so the cooling plant is cheaper. The difference between the peak energy demand and the average energy demand in heating and cooling in both commercial and residential buildings is still a challenge. Even as we try to make the most out of the energy produced, the mismatch between usage and availability poses inefficiency challenges. Is this something we can tackle using Ice Storage Tanks? Storage coils: that there are many storage coils, sometimes in their hundreds. This design a highly technical measure, as it increases the evaporator surface thereby increasing refrigeration efficiency. Consistent performance: The Ice Storage Tank is designed for consistent supply of cold water (35 degrees Fahrenheit) throughout the cycle. The secret to these low temperatures is direct contact and an increased surface area. Two feed systems: Further efficiency within the tanks is enhanced using two feed systems for the refrigerant, whose rates are higher than the load requirement. The high flow rate assures adequate heat transfer coefficients for efficient utilization of the coil surface. Intelligent use of utility electricity: And therefore, a positive economic impact. Thermal Ice Storage utilizes night-time off peak electricity. This means that the usage of utility electricity during peak demand hours is minimized. If there is another impressive thing about Thermal Ice Storage, it is the relatively low capital costs. Storage tanks normally require less space than the one used by chilled water storage. This means that your building or real estate costs will be less of a burden. It is no wonder that ARANER’s Ice Storage Tanks are becoming an important investment for financially conscious institutions. Reduced footprint plus economic impact on companies’ energy investment has caught the eyes of investors and managers. Ice Storage Tanks are just one of our Thermal Energy Storage range of solutions. Stratified water-based Thermal Energy Storage Tanks are a more efficient solution, used by many companies to improve the power usage of TIAC and District Cooling Plants. Do you want to learn more about our Thermal Energy Storage solutions? Visit our website or download for free our Thermal Energy Storage Reference Book.